South America is known for its delicious foods including steak, empanadas, dulche de leche, ceviches, and yerba mate. On this trip we indulged in so much, except for yerba mate; a tea that’s a staple in the South American diet. We saw people walking in the streets sipping on yerba mate everywhere we went, but we did not see it available on any of the restaurant or cafe menus. That’s all right though, we brought some home with us. This is a chivito sandwich, the national dish of Uruguay made with a piece of chicken, fried egg, tomato, mozzarella cheese and usually a piece of bacon. Excuse the red film; this happened because I took the photo without the flash while sitting under red umbrellas on the patio. 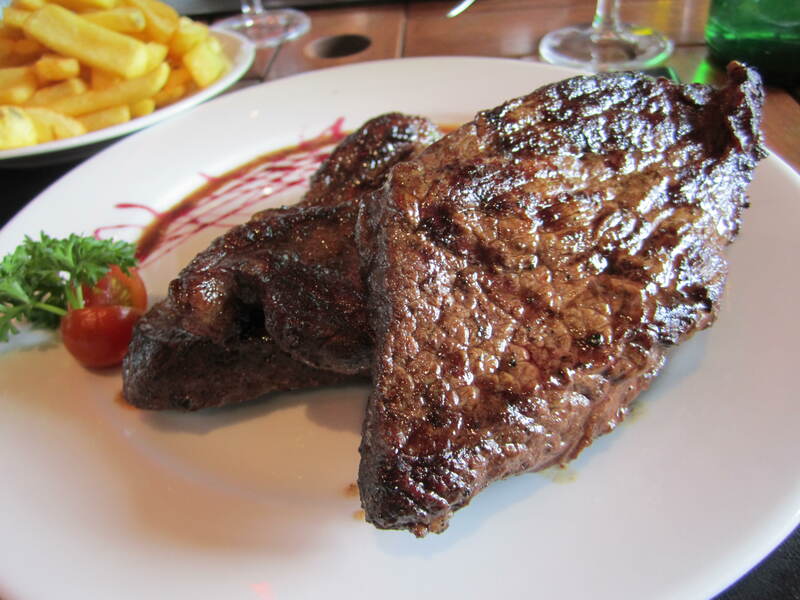 If you love steak, you’ll be in love with asado in Uruguay. Asado is all about the fire, the grill and the meat. Some people call it bbq, but many South Americans prefer not to hear you reference it this way. 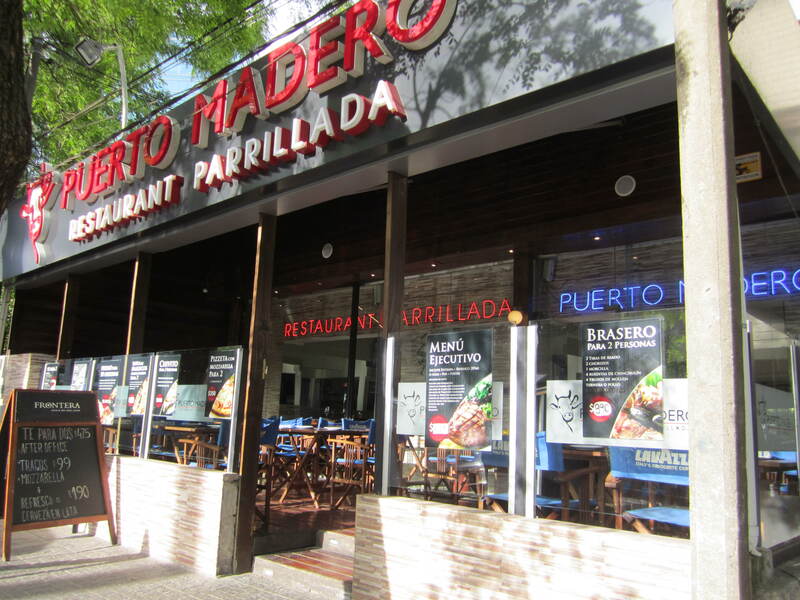 We had a good portion at Puerto Madero, the steakhouse near the World Trade Center. The steak was juicy and served with fries as a side. The spring weather was nice this day, yet the patio was empty. For most people this would be a bad sign for the restaurant, but we like to give business to the small companies that don’t have a ton of advertising. The owner was so kind to take his time to show us the menu, we couldn’t help but take a seat at his restaurant and we were so pleased that we did. After this awesome meal we took a walk in the area (Pocitos) and stumbled upon the charming cafe, The Lab. The coffee and treats were perfect and probably the best dessert I had in this country. When you visit Punte Del Este, choose piazzarella. This restaurant gets their dough flown in from Italy. The pizza was like no other and my husband who normally gets heartburn (acid reflux) from pizza didn’t have it at all. It must be something about the sauce. We arrived at this restaurant by fluke and absolutely enjoyed it. Inmigrantes is a local gastropub that opened up about 3 months ago. I think we were the only tourists in the place as the location is tucked away in a neighborhood with not much else around. When we arrived the place was packed, the DJ was spinning the beats and every seat in the place was filled. The kitchen was busy and the wait staff were running tables with a little stress and class at the same time. Our food took a while, but it was worth the wait and the hospitality made up for every minute we thought they had forgotten about us. At the time of writing this article, the restaurant accepts cash and debit only. A fritatta style dish with potatoes, egg, and cheese. Uber delicious! Our final meal was in Montevideo at La Otra for asado. We were thrilled to learn that Anthony Bourdain’s team ate at this restaurant and it will be featured on Parts Unknown in 2018. So you’re getting our review about this quaint spot first! We arrived for lunch closer to 4pm, which I would not recommend you going at that hour because the staff seemed exhausted by a hectic afternoon lunch rush. By the time our food arrived we were so hungry, we dived in before taking pictures of the ribs. I give the food 5 out 5 stars. A few tips for you when dining in Uruguay. Tip anywhere from 10% and above. Ask the restaurant before you sit down if they accept credit cards. There are two taxes totaling 22%, but if you are a foreigner using Visa or Mastercard there is no tax for you. Some restaurants have a sitting fee for each person on top of your bill. It is written on the menu and on your bill as Cubiertos, which means cutlery in English.